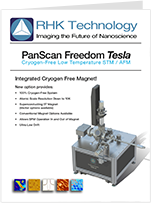 PanScan is available with both STM and AFM capabilities. All Pan-style scan heads owe their origin and name to Dr. Shuheng Pan, University of Houston - Department of Physics, who was the original developer of this piezo-motor style. His Pan scanner is well known for its stability in extreme environments. 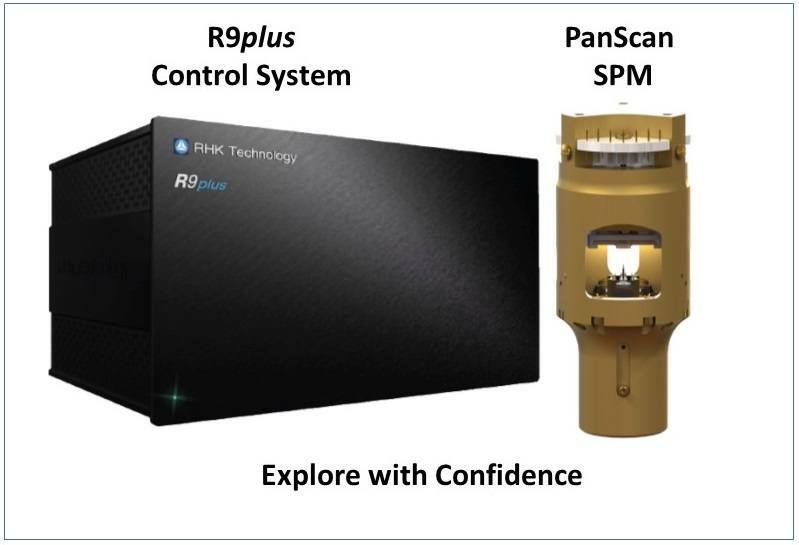 RHK collaborated directly with Dr. Pan to commercialize his design, enhancing the original by adding XY offsets, in-situ tip exchange, multiple points of optical access, and AFM-qPlus probes – all in a remarkably rugged and compact modular package. 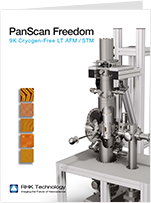 PanScan is available with STM only or with both STM and AFM capabilities. AFM-qPlus and STM probes are switchable in a vacuum. qPlus sensors include a conductive tip for combined AFM and STM scanning techniques. Both of these complementary proximal probe techniques provide atomic resolution. 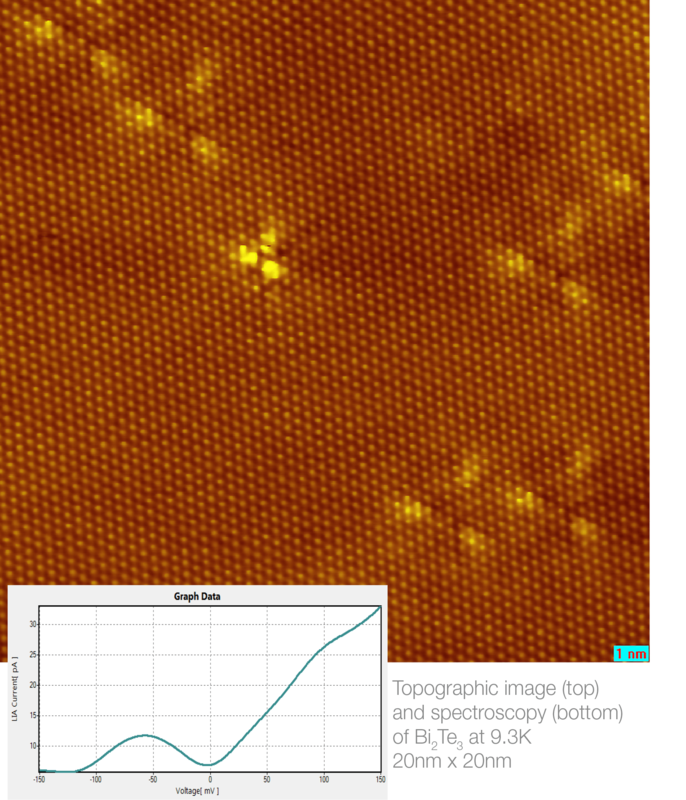 The unique value of AFM is its applicability to a broader range of materials, especially insulators. 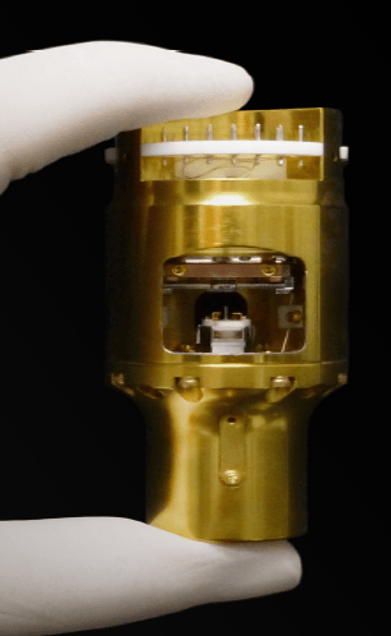 By utilizing probe holders with the same mounting base, you can easily load both STM and AFM-qPlus probes into the tip storage positions and switch between them in situ. The compact size and non-magnetic construction of PanScan make it ideal for operation from mK to 400K. Uniquely designed for easy adaptation, PanScan is available in a variety of configurations from kits for the atmospheric operation to complete cryogen-free low-temperature systems. 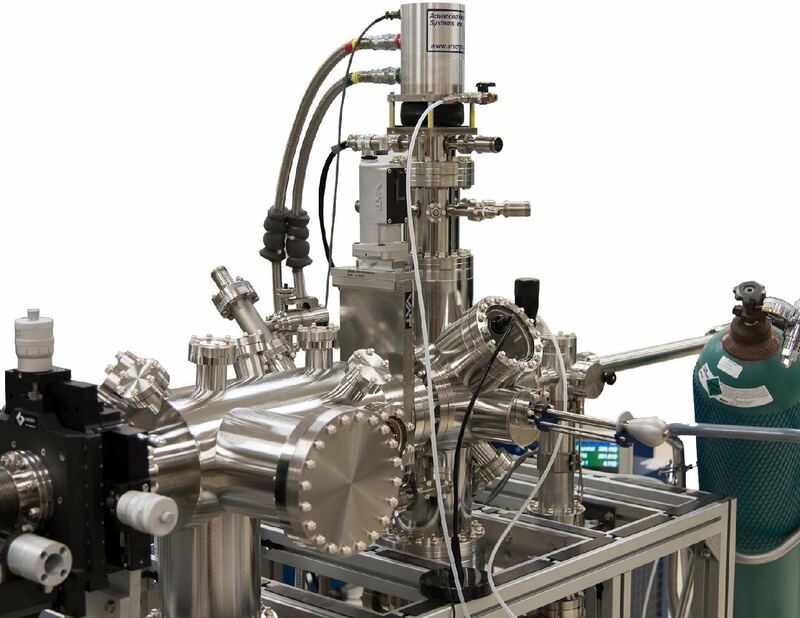 World's first closed cycle cryogen-free system for stable low temp performance, unprecedented low drift, exceptional spectroscopy, and atomic resolution in a surprisingly compact and affordable package. 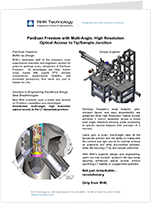 World's first closed-cycle cryogen-free SPM system, plus a closed-cycle cryogen-free superconducting high-Tesla magnet, all in one. Freedom performance, and high magnetic fields -- without ever paying for liquid cryogens. For researchers who need LT temperatures less frequently, PanScan FLOW provides easy flexibility. Readily switches between LN2 (82 K), LHe (12 K) and RT. Same rock-solid stability and uniform tip/sample temperature as Freedom. 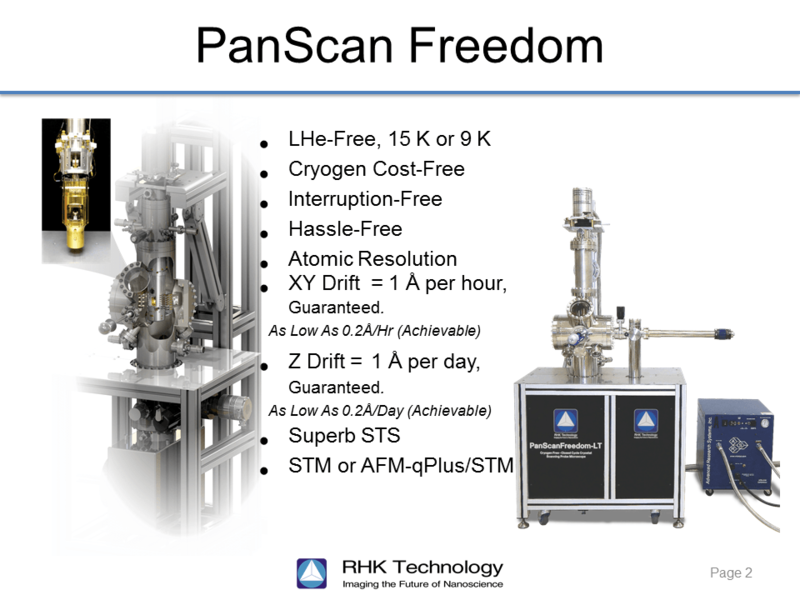 PanScan RT Ambient or UHV provides a strong SPM foundation as is, and also a clean, economical path to LT Flow or Freedom when needed. From Subsystems to Full Systems, PanScan is an ideal lab choice. PanScan Powerhouse: Ultra-stable and rigid, ultra-low drift, STM/qPlus-AFM, mK to 400 K, high mag field compatibility. Proven under grueling conditions, peer-reviewed publications. From Kits to ground-breaking Closed-Cycle. Every day, in universities and government labs around the globe, RHK research platforms lead to new discoveries in Nanotechnology. Founded in 1981, RHK Technology brings over 35 years of experience to the design and manufacture of advanced UHV SPM instruments and control electronics. Our installed base continues to grow and now includes over 175 systems and 1000 controllers. Customer success is the driving reason RHK has been in business since 1981. 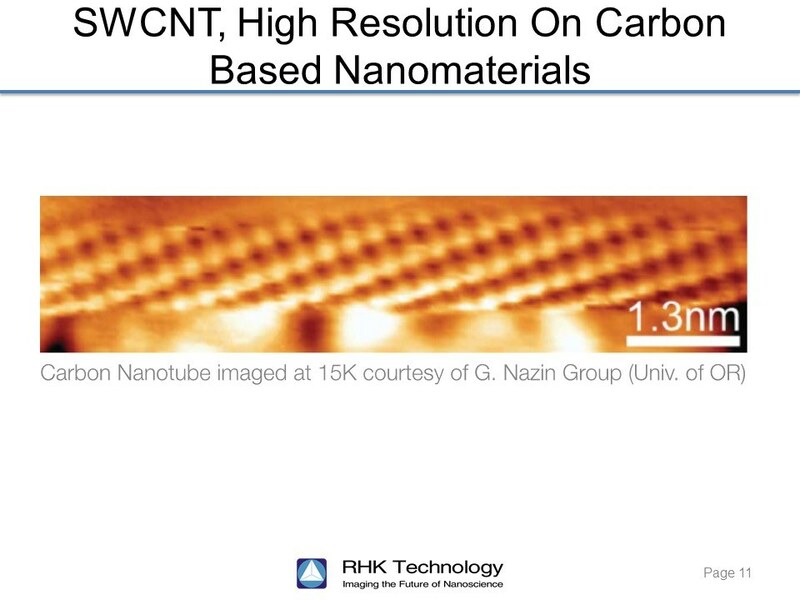 Everyday, in university and government labs around the globe, RHK research platforms lead to new discoveries in nanotechnology. 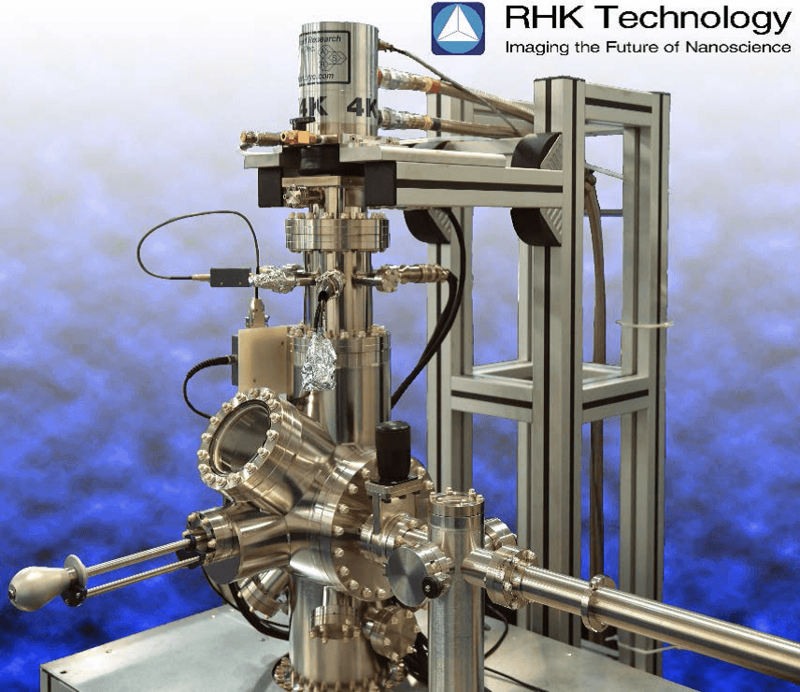 RHK Technology brings over 25 years of experience to the design and manufacture of advanced UHV SPM instruments. Explore with Confidence. I was really impressed by your PanScan Freedom working so smoothly in the noisy environment of the AVS exhibit! The stability was superb and I loved immensely the closed circuit of He gas. This is so cool and so great at a time when getting liquid He is not an easy thing (not to speak of the cost). I wish I had the money right now to buy one! I am amazed by the quality of images that your new PanScan Freedom SPM can deliver in a noisy exhibition room. The cryo-free feature makes it much more affordable than conventional cryogenic SPMs. This new microscope should be a dream platform for many customers who have a small budget but a high passion for quality SPM work. The topographic images that you obtained on the first day you received my In doped Bi2Se3 sample were equal in quality to the published results that we obtained using our commercial bath cryostat STM. It is amazing that such results could be obtained with a closed-cycle cryostat. 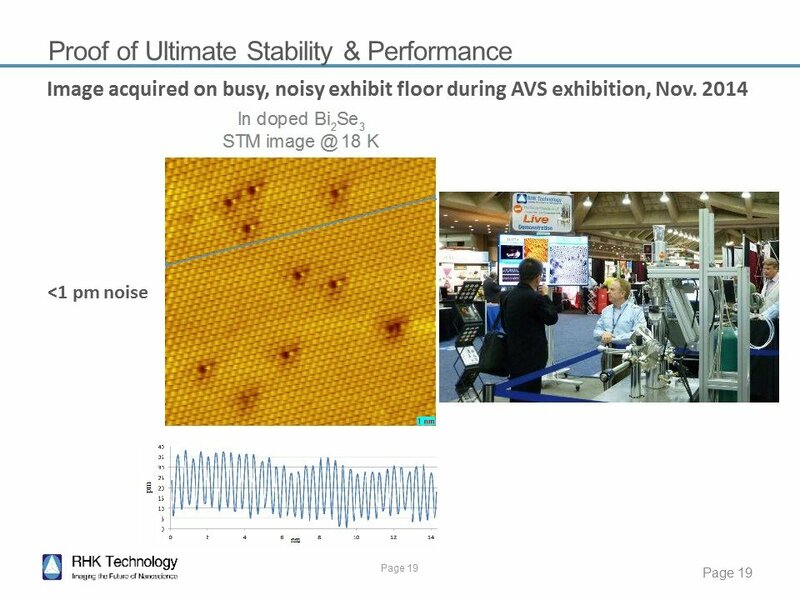 That you could get equally good results with the system running just sitting on the floor in the exhibition hall during the AVS conference is nothing short of remarkable! Your system is definitely on my wish list for a future purchase. The real time demo of atomic scale imaging of a topological insulator surface at the APS March meeting, in that essentially street level setting with the cryogenic compressor running is simply awesome. All these physicists walking by and taping on it did not make any difference… It is very impressive! All these physicists walking by and taping on it did not make any difference… It is very impressive! Having worked with an STM for a couple of years, I can clearly appreciate the magnitude of this fantastic accomplishment by RHK Technologies. I am totally confident in our choice…. 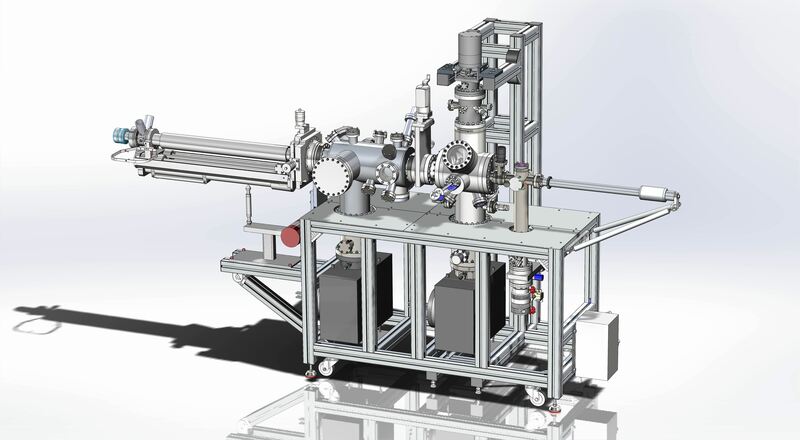 a custom built mK STM/c-AFM from RHK, to be delivered to us soon …. I chose the PanScan Freedom after seeing the technology both at APS 2015 and the RHK factory. The ability to continue my low-temperature research without the concerns of sourcing liquid cryogens was one of the deciding factors. We have a very challenging environment for an STM and RHK was willing to work with us to ensure that a customized solution would not only couple to our existing system but be able to perform as advertised. While other vendor’s visited our lab and conducted vibration measurements with accelerometers, RHK went so far as to bring an actual scanning stage and electronics to our lab to evaluate how well it would perform in our lab. While your scientist indicated it was the worst environment he had encountered, he also remarked that the scanner had performed better than expected. Such attention to details and extensive evaluation of the situation is what makes RHK stand above other vendors. It is clear that your scanner is the only one that will provide world-class data in our environment and you were willing to prove it prior to purchase. Due to the sensitivity of ARPES to magnetic fields we have cryopumps on our vacuum system and thus we know how much vibration they create. Knowing that RHK is confident enough in their scanner to provide a cryocooled manipulator gives us confidence that the noise and vibrations on the synchrotron experimental floor will not be an issue for your instrument. In addition, liquid helium is a scarce resource that is becoming increasingly expensive. Additionally, several projects in our lab were impacted by the recent helium shortages. Having a cryogen free cooling stage will not only save us tens of thousands of dollars annually, but will ensure continuous operation without relying on such a scarce resource. Cryogen free systems are becoming a necessity in low temperature research and designing a scanning probe microscopy that has superior performance while utilizing such a system shows how RHK is leading the industry in their field and how they are continually pushing the envelope. My new PanScan Freedom is working great. We were very happy with the performance of our original PanScan microscope with the flow cryostat, but the cost of liquid helium prevented us from cooling to helium temperatures on a regular basis. Now that we have upgraded to the closed-cycle version, we can stay at the base temperature all the time. This is much more productive for our research. We were very happy that we did not need to make any changes to our existing STM or preparation chambers and the upgrade only took a few days. I would recommend the PanScan Freedom to anyone who wants low noise and high stability STM measurements. With its recent introduction to the market, researchers are already generating a significant number of publications with the PanScan family of microscopes. Below is a partial bibliography with references from our PanScan users. We make every effort to include as many papers as possible, but it is unlikely that we catch them all. Please email us if you have recently published a paper using an RHK SPM or if you wish to receive more information on a specific application.